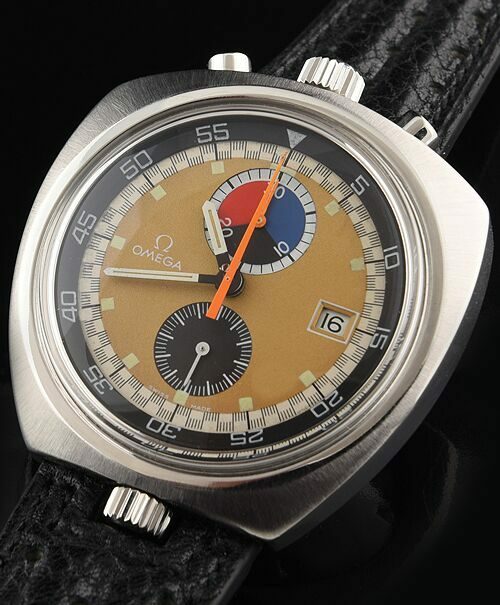 Here is a rare all original and correct OMEGA BULLHEAD DRIVERS CHRONOGRAPH from 1971. This watch comes complete with extract of the Omega archive papers and signed by the president. This massive OMEGA measures 43.3×43.5mm (16mm. thick) in a solid, shimmering stainless steel case. This OMEGA watch sits high on the wrist and angled towards the wearer in a stopwatch-like position. The top crown winds the manual winding Cal. 930 (by Lemania-just meticulously dismantled and cleaned) OMEGA movement-shimmering “like new”. The bottom crown rotates the inner bezel. 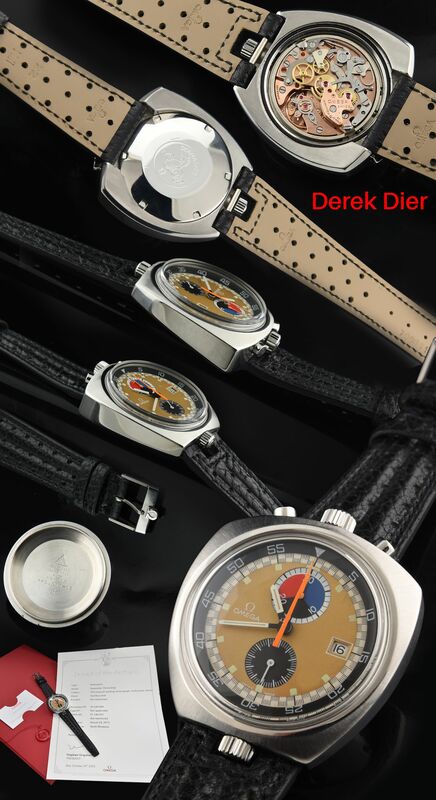 These chronographs were designed to time auto races, and their incredible dials attest to that. Notice the checkered, outer register and multi-coloured segmented minute counter register with neon orange hand, along with black register with running second and neon orange chrono hand-all original. This is a new OMEGA leather band and buckle installed on the watch. This dial and inner rotating bezel are original and correct. The right pusher starts and stops the chronograph, whilst the left resets precisely to zero. If you are looking for one of the rarest and most sought after OMEGA sporting watches…you found it. This is a true “investment” OMEGA.